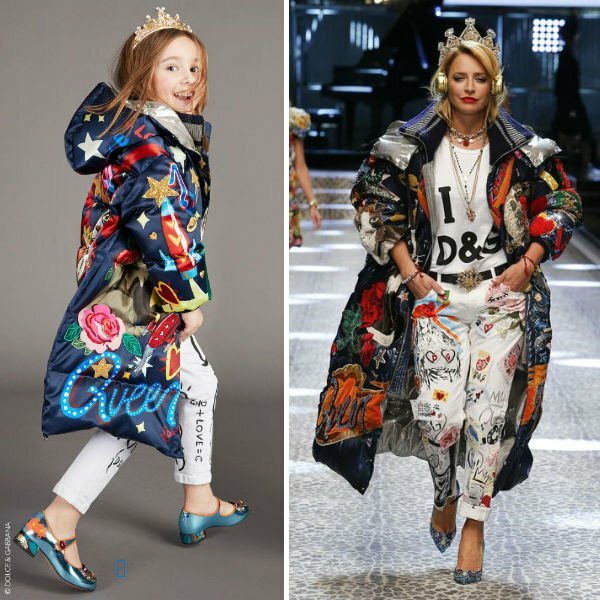 Love this DOLCE & GABBANA Girls Mini Me Space & Love Down Padded Coat. A mirror image of the Dolce & Gabbana Women's Fall Winter 2017-18 Runway Show, this adorable coat features the most loved D&G prints from the Me & Space Love theme. She'll love the detailed exquisite appliqués for an added touch of luxury. Complete the look with a white I Love D&G Shirt and DOLCE & GABBANA Girls White 'Gatto' Jeans. Don't forget the metallic blue Mary Jane Shoes an the Royal Gold Crown!